Working from Imagination - Can It Be Developed? Sketchbook Skool Semester 3 overlapped with our vacation last Fall, and I still want to do homework assignments from Weeks 3 and 4. I was too busy, that is my excuse. But really that is subterfuge. Both Mattias Adolfsson and Jean-Christophe Defline assigned us homework that required drawings from our imagination. YIKES! That is not easy for me - I draw what I see. 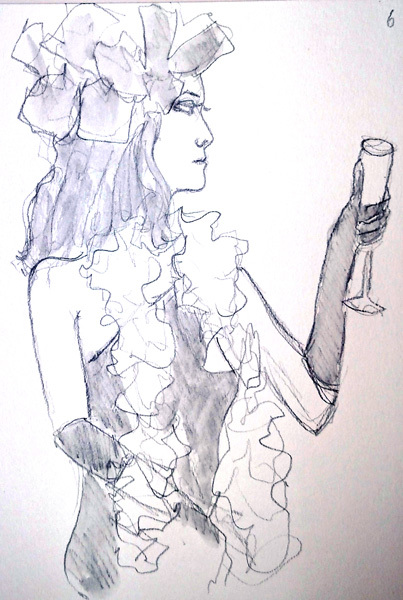 I can combine my subjects into new compositions, but I rarely draw anything completely from my imagination. So for 6 months I've been periodically thinking about my first day of school - many, many years ago for sure. I had no specific story to tell, I can't even remember my kindergarten teacher's name. 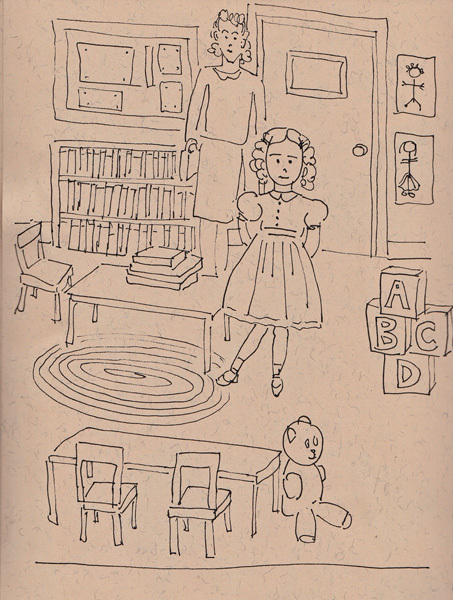 But I did have an image of a corner of the room, with a rug, tables, chairs, and toys. And I knew that my mother walked me to school and dropped me off in the classroom on my first day. So I finally just sat down and started drawing. I knew my hair style, and my Mother's hair style and the clothes I probably wore. So here, finally, is a story about my first day of kindergarten. Our second homework assignment from Mattias is to do a meta-drawing. I think I need to let that roll around in my brain for awhile too, but hopefully not for 6 months. I am even confused about the exact meaning: Meta-film is a film about making a film. Mattias elaborates on the assignment by calling it a drawing with enhanced reality. I'm posting two completely unrelated Sketchbook pages today. My friend Pat and I went to two Asian Art Auction Previews on Friday. Sotheby's had a terrific preview for their Modern and Contemporary Asian Art Auction. Over the last two years, I've discovered several Indian artists whose work I LOVE, and there were many paintings by each of them (Husain, Prahba, and Souza). Christies was a disappointment for those of us who weren't there to see Asian ceramics, jades, brass sculptures etc., because they had 1600 art objects from one collection to auction! But the paintings on the Chinese scrolls definitely made up for it. I took lots of pictures so I can try to learn from the brush drawings of roosters, tigers, herons, camels, and chickens. I sketched one painting, and one detail of stylized cows from another painting at Sothbys, on one sketchbook page, to remember the day. Yesterday I watched a video called The Life of an Artist (2012) by Adebanji Alade that was very inspirational. 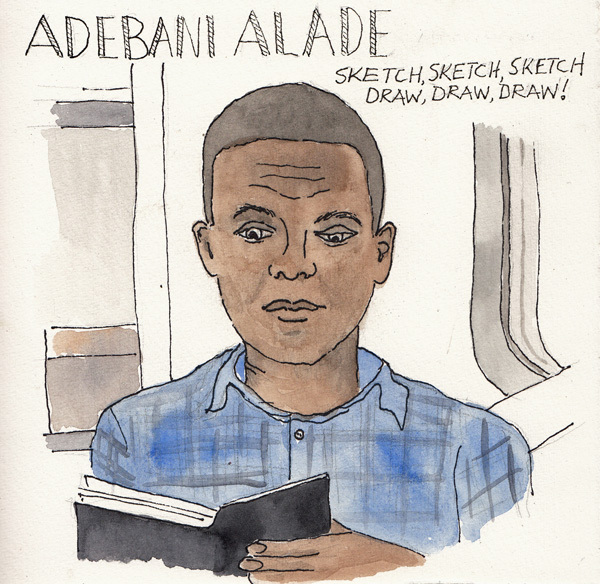 I paused the video while he was sketching on public transportation and sketched him, so I could remember his advice, "Sketch, Sketch, Sketch and Draw, Draw, Draw." Oops - misspelled his first name on the sketchbook page! This was our second week of drawing and shading. 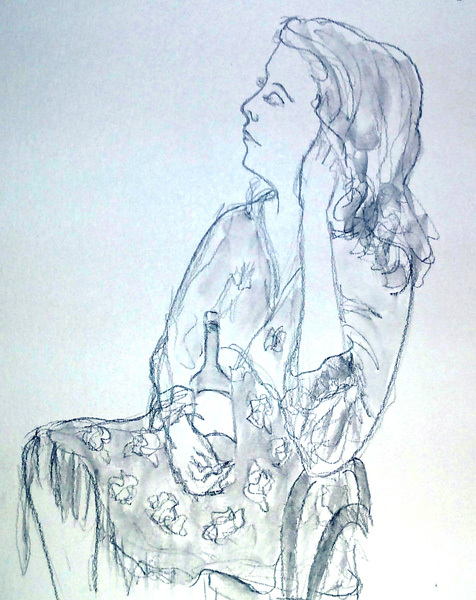 I haven't had a drawing class before, but this one seems to be moving VERY Slowly. 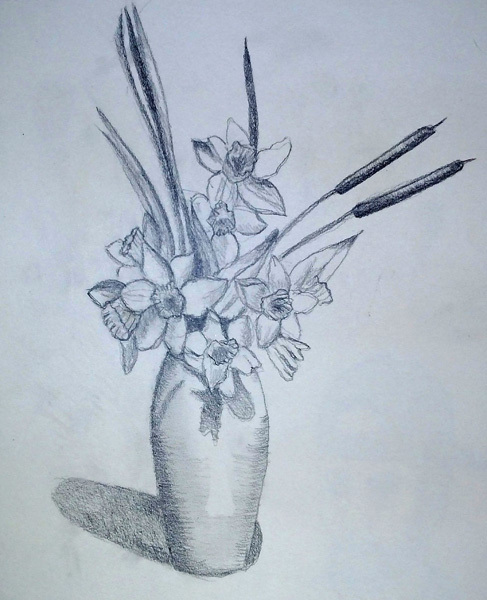 There was a still life bouquet for us to draw and shade, and then hard-boiled eggs that we each brought in from home. One of the best parts of the exercise was having an amazing standing lamp lighting the flowers, and vase, and casting shadows. This was an 11X14 inch drawing that was photographed. 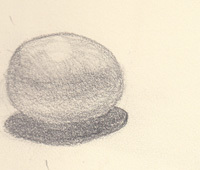 The egg looked so small set up on the central table, and was harder to shade than I anticipated. 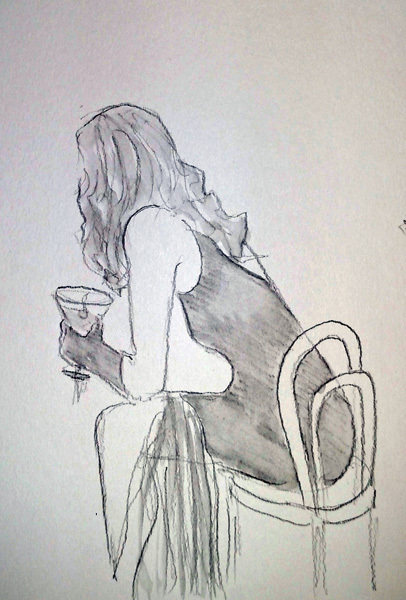 Then I got bored while everyone was still working, so I sketched one of my classmates. This exhibit just opened at the Metropolitan Museum of New York and it is spectacular. I went to the Member Previews last week, excited by the postcard that arrived about a month ago. 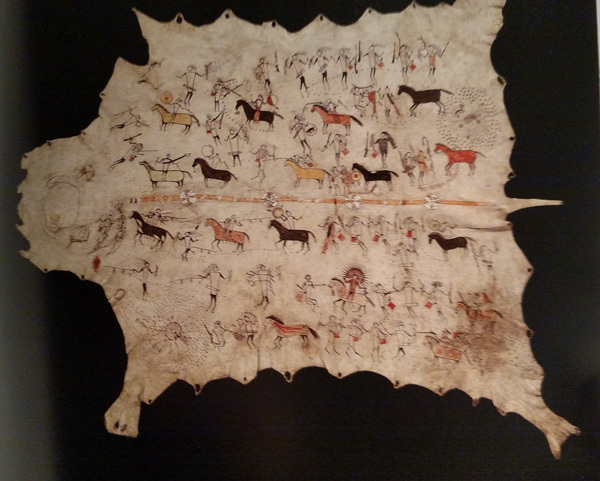 Pictographs are among my favorite images and I didn't know what to expect, but was thrilled to find several tanned leather hides and clothing with ink and pigment drawings. This is called the Grand Robe and I took a photo of it from the Exhibit Catalogue because no photos are allowed in the exhibit. The catalogue says that there were hundreds of these robes made and only 5 remain. Three are in this exhibit, including this one on loan from the Musee de Quai Branley in Paris. There are 60 figures on this robe, depicting 14 battles - and I sketched a few of my favorites. I also attended a "Conversation with a Paper Conservator", who worked on the Maffet Ledger Journal over 18 months before, during, and after it traveled to Paris and Kansas City where this exhibit began. 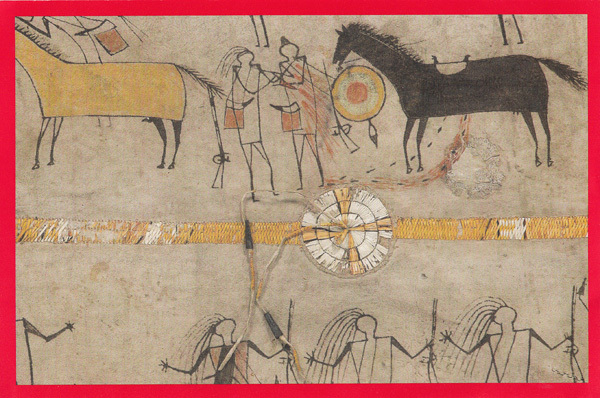 George West Maffet distributed some ledgers among the Northern and Southern Cheyenne tribe in the mid-1800s and this ledger contains narrative stories in drawings by 22 different artists. Most of the drawings are scenes from battles against the Cavalry. Not only was I interested in the paper conservation information, but it was so interesting to hear how they poured over the drawings to try to separate the artists and translate the images. 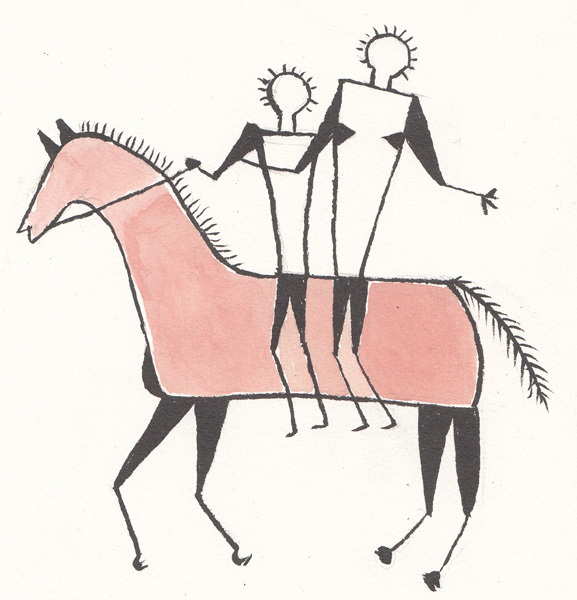 Here is one of the paintings in the ledger. In order for indian boys to establish their bravery, they had to coup a soldier, which meant touching them with their sword, or bow and arrow, and then escaping without being harmed. The conservator said that they did lots of research to understand the implications of many of the drawings in the ledger. 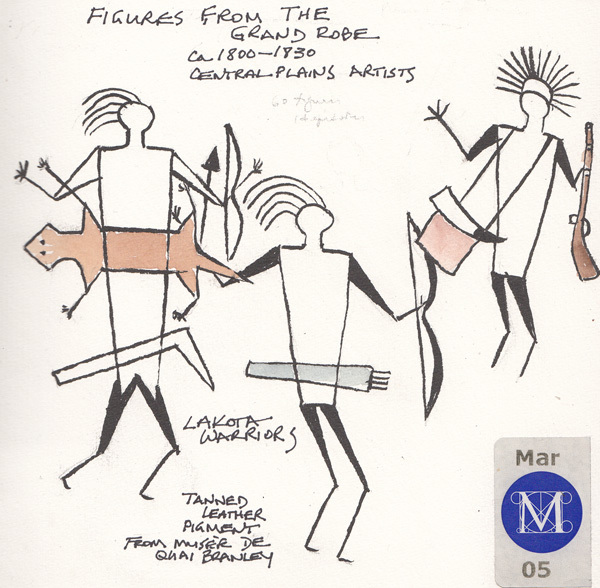 This is a link for the Maffat Ledger on the Museum Website. There are 23 pages pictured at this link. All the while she was speaking, I wondered if any of our sketchbooks and journals would survive and be analyzed for information about the times in which we lived. This is a link to the video of current Indian Artists and how their work evolved. The Museum of Modern Art Toulouse-Lautrec Print Exhibit is closing mid-March and I will miss it terribly. I will miss my regular visits to the exhibit, my drawings from his prints to warm up, and the Café Society Figure Drawing session that occurred twice each month since the Fall. 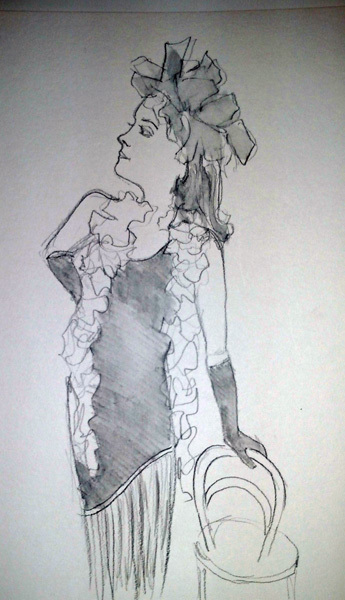 Today I am posting 2 warm-up Toulouse-Lautrec drawings and 4 drawings from my favorite model - Kelly. 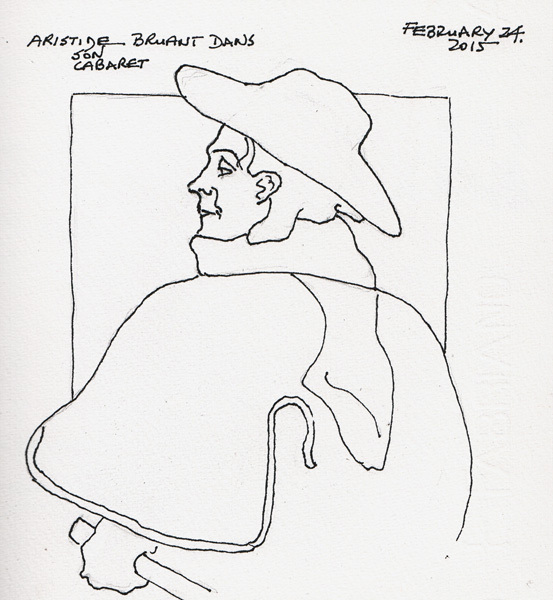 Aristide Bruant - Performer and owner of a Montmartre Café. 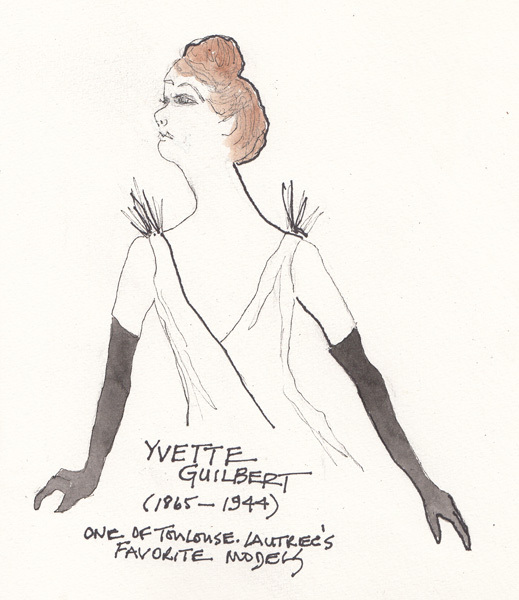 Yvette Guilbert - Perfprmer and one of Toulouse=Lautrec's favorite models. These are some my 6 minute drawings of Kelly - drawn on 11 X 15" watercolor paper with soluble graphite and then shaded with a waterbrush. These were photographed because they were too big for my scanner.